"Four thousand years ago, in a galaxy far away from copy right infringements..."This is for you!The Late Night/Early Birds/ Future Warriors! Hello fellow TAYers! The tables have been set, wages for the matches met, and the your deck is ready for a second play of PAZAAK on this late edition of TAY: Open Forum. Otherwise know as the Graveyard Shift! Tonight's Shift...The Future yet Old Republic! You know what's funny? Looked for the case for the game, and try it out just for old time sake, and lo and behold the manual is there, but the disk is missing... ( ._.) *is this sorrow? 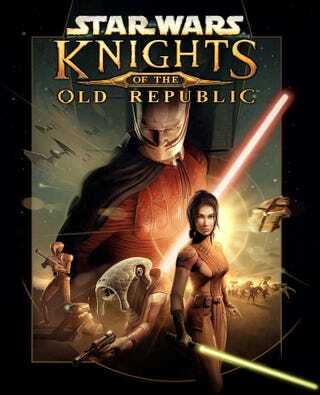 Many have heard or played the new MMO for KOTOR, but even by not playing it, I can tell it has loss something (for lack of a better word) that the previous two games had accomplished. But not going to critique, and compare the old with the new, that's not the way of the shift. Now, what made this game great besides the whole Star Wars franchise (oh man those planed films!) is how outside it was from what I knew from the films, and a couple of books. It was a freshening to dive into a whole different yet same galaxy, just like in Mass Effect. But still being the same, and somehow there was always something to look forward to on the next planet, even when backtracking for missions. The combat system although done in phases, was new to me. It did not feel tedious or slow, rather it made combat flow at a interesting pace to say the least. *lightsaber boomerang throw! The bio attachment to you character added an interesting touch of variety besides the armors. It was interesting how they explained the reason why blades could stand up to a lighsaber...even if it felt like bull at first. What's that? Why so late? The shift is never late nor too early, it is always on the time it need be! What? That's bull? Okay sure...Any way feel free to talk about KOTOR or Star Wars for that matter. What? You want to talk about something else? Okay, either way its now or never!